On November 16, 2016, after eighteen months of careful deliberation, the Congressional Commission on the American Museum of Women’s History (AMWH) submitted their official report to the President and to Congress. The occasion was marked with formal presentations on Capitol Hill with the bill co-sponsors and Congressional leaders, followed by an evening reception attended by the Commission’s generous supporters, contributors, as well as other members of the public. The submitted report contained recommendations on topics relating to a future women’s history museum in Washington D.C. as requested by Congress in HR 3979 – 2014. Such topics included addressing the potential location, content, and governance structure of the future museum, as well as, the threshold question of why America needs such a museum. For a detailed summary and description of the Commission’s recommendations and research, we encourage everyone to read the full report (or even the snapshot!) at amwh.us/report. On the morning of November 16th, all seven Commissioners went to Capitol Hill to formally present the final report to Congressional leadership, as well as to the legislative co-sponsors. These presentations included: Senate Majority Leader Mitch McConnell (KY), Senate Minority Leader Harry Reid (NV), Speaker Paul Ryan (WI), and House Minority Leader Nancy Pelosi (CA), as well as co-sponsors Representative Carolyn Maloney (NY), Senator Susan Collins (ME), Senator Barbara Mikulski (MD), and Representative Marsha Blackburn (TN). These leaders were incredibly gracious with their time, receptive to the Commission’s recommendations, and very pleased that the Commission addressed, in detail, all of the tasks and questions identified by Congress. 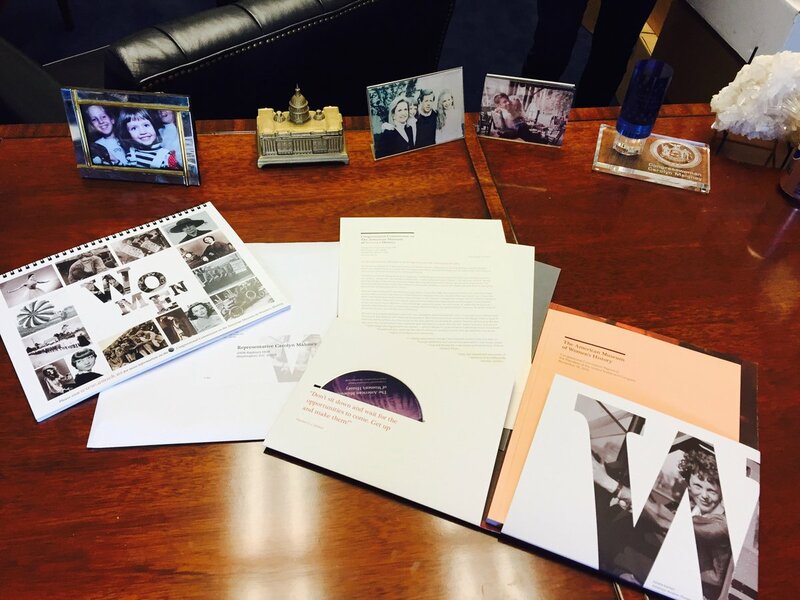 That afternoon, a copy of the full written report, a summary of the report, and a DVD of the report were hand delivered to each member of Congress and key committee staff members by an able band of volunteers including Girl Scouts and Cub Scouts! Commission Chair Jane Abraham (right) and Commissioner Marilyn Musgrave (left) pose next to Speaker Paul Ryan with copies of the Commission’s report. The submission of the Congressional report was unique and precedent-setting. In addition to supplying physical copies to Congressional leadership, the Commission also made the report available in a digital format, the first of its kind to be submitted to Congress. This digital format reflects a contemporary approach to technology that the Commission hopes the future museum will have, in addition to increasing the overall accessibility and transparency of the Commission’s work. The digital report is available to the public via access to www.awhm.us. 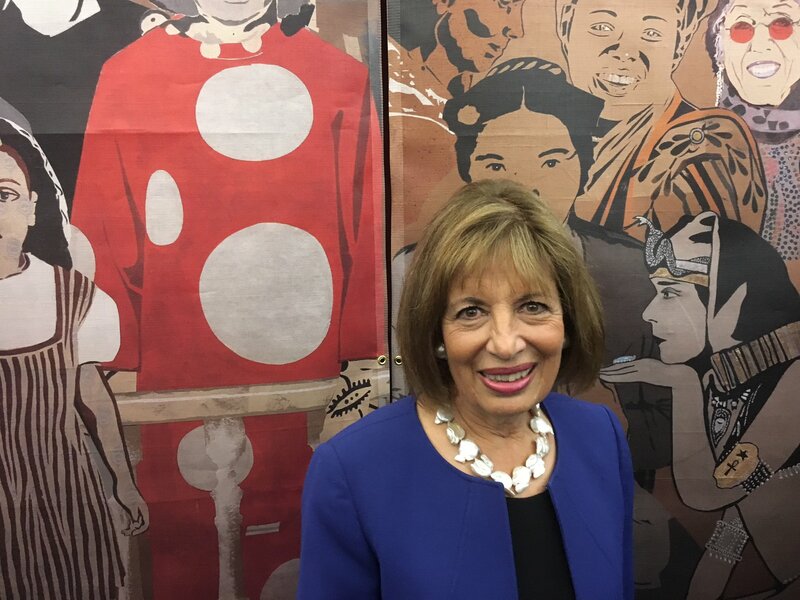 After the reports were delivered, the Congressional Commission on the American Museum of Women’s History hosted a celebratory reception in the Capitol’s Ways and Means Room. This event provided an occasion for the Commission to thank those who helped make the report possible, as well as to celebrate and promote the Commission’s ongoing work with supporters – both old and new. Commission Chair Jane Abraham speaks to reception attendees. In her remarks she touched on the Commission’s research process and final recommendations. The Commission was honored to have several national leaders give remarks at the event. These speakers included: Leader Nancy Pelosi (CA), Senator Susan Collins (ME), and Representative Carolyn Maloney (NY). 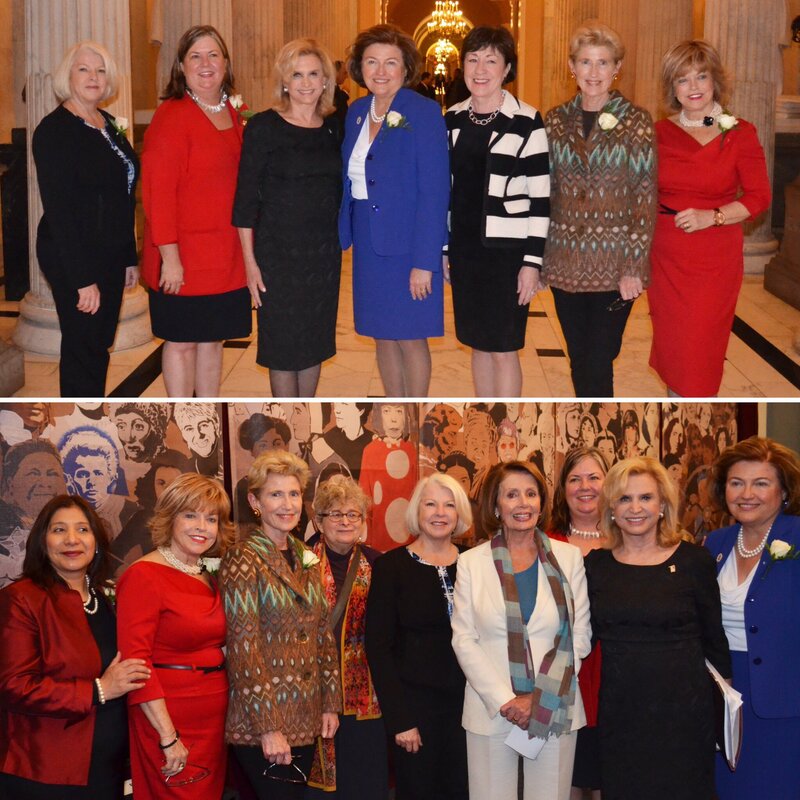 These formidable leaders each provided anecdotes and persuasive arguments for why a national museum dedicated to American women’s experiences and accomplishments is long overdue, and how we can work together over the coming years to make it a reality. Teenage entrepreneur and animator, Maya Penn from Atlanta, Georgia, also addressed the audience and made an emotion appeal to Congress as to why a national museum dedicated to women’s history is particularly important to the next generation. Top: Members of the Commission pose with Representative Maloney (NY) and Senator Susan Collins (ME). Below: Members of the Commission pose with Leader Nancy Pelosi (CA) and Representative Maloney (NY). The Commission was honored to have a number other Senators and Congresswomen attend the reception, including Senator Heidi Heitkamp (ND), Senator Debbie Stabenow (MI), Representative Maxine Waters (CA), Representative Susan Brooks, (IN), Representative Sheila Jackson Lee (TX) and Representative Jackie Speier (CA), as well as the Acting Provost for the Smithsonian, Richard Kurin. In addition to the given remarks, guests also enjoyed several interactive stations at the reception. These stations demonstrated the diverse and powerful means that could be used to present women’s history to the masses. Guests at the reception were treated to a special surprise. The godmother of virtual reality film making, Nonny de la Peña of the Emblematic Group, created a virtual reality studio in a room next to the reception for the attendees to put on VR glasses and experience being in the room when the Declaration of Independence was first mass produced with the signatures, by a young 17th century woman named Mary Katherine Goddard. Mary Katherine risked her life to print copies of this important document on her family’s printing press. This was the first public announcement that identified those historic figures that penned their names. Experience this fun reenactment on YouTube! Guests could also learn more about other historical female figures through interactive digital glossaries made available at the event, or through a stunning mural that featured notable women throughout the centuries. Artists Jann Haworth and Liberty Blake created a 28-foot-wide mural with over 100 amazing women. An electronic canvas next to the mural was able to tell the viewer more details on each of the featured women and their remarkable stories. 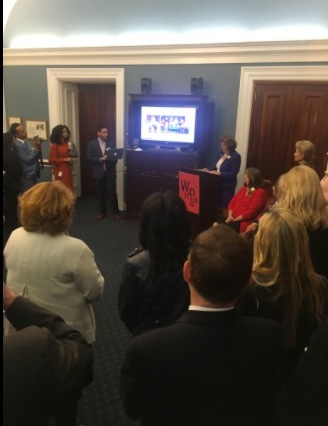 The Commission was honored to have so many people attend the reception to share in the enthusiasm for this cause, and to bear witness to the broad and devoted coalition of individuals who are, inch by inch, going to make a women’s history museum in Washington D.C. a reality. What’s Next for the Commission and the Museum effort? The Commission recommends that the pathway to a standalone women’s history museum is to first establish a Women’s History Initiative within the Smithsonian Institute, as outlined in the Action Plan in the Commission’s final report. This Smithsonian Initiative will begin the process of recruiting talent and developing exhibitions within existing Smithsonian museums that will then act as a base upon which to build an eventual physical museum. This is the crucial first step in creating a women’s history museum of national prominence. Members of the Commission and its staff are fully committed to do their part and to work side-by-side with the Smithsonian leadership to see this process through. A series of conversations to begin to investigate how this Initiative might be established have already taken place with the Secretary of the Smithsonian, David Skorton. For further information on the steps the Commission, in concert with the Smithsonian, plans to take to make this museum a reality, please review the Action Plan section of the final report (amwh.us/report).